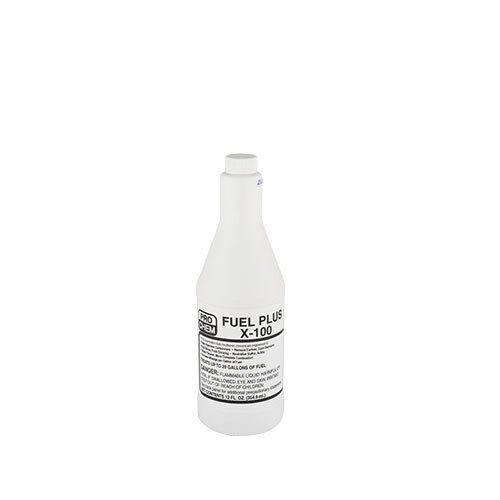 FUEL PLUS X-100 | Pro Chem, Inc.
Fuel Plus X-100 is blended to neutralize harmful fuel acids, as well as eliminate the damage caused by sulfur, gum and varnish that is in all fuels. It is oxygen sensor safe. The antiwear, additives and penetrants are stable solutions that offer outstanding performance and are safe to use in engines that use all types of fuel, including engines equipped with catalytic converters. Recommended for use in off-road diesel, gasoline (leaded and unleaded), L.P.G. and kerosene fuel vehicles. This product can also be used to free frozen nuts and bolts or as a penetrating oil that will stay on the surface and prevent corrosion and oxidation on fishing tackle, farm implements, fertilizer equipment, weapons and other similar applications. NOTE: For L.P.G., propane, or natural gas engines, use with a Universal Top Oiler.